One stretch of scaffolding along Mumbai’s skyscraper-speckled skyline is especially dense. More than a dozen luxury apartment towers stand unfinished, and their concrete hulls reach up into this seaside city’s thick haze. Among them, one has generated unusual buzz. It is the one that will soon glimmer with a facade of gold-tinted glass, with the name of the president of the United States emblazoned across it. Ritesh Shah once worked in New York City’s diamond district, not so far from the original Trump Tower. He’d gaze up at the building in awe. Then, in 2014, Donald Trump announced that he’d be lending his name to a 75-story building in Shah’s native city, slated for opening in late 2018. Together, more than 50 diamond traders, including Shah, bought apartments – and they got a deep bulk discount in the process, he said. The discount was important, even for this slice of India’s super-rich. 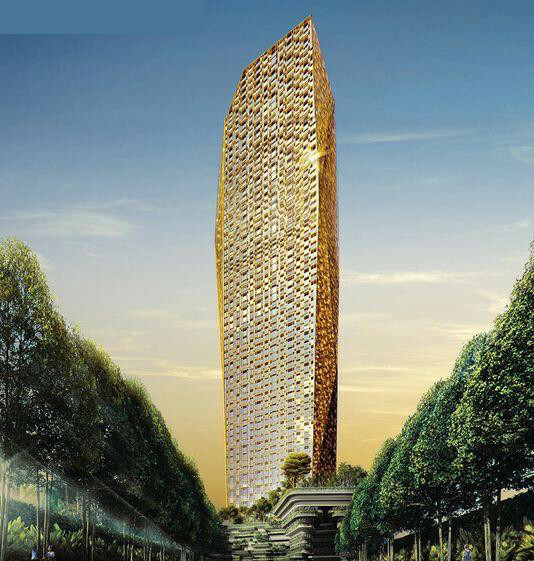 Units in Trump Tower Mumbai are listed at prices roughly 30 percent higher than units in comparable buildings. The premium derives from the brand-licensing agreement the Trump Organization signed with the building’s developers: the Lodha Group, a giant, family-owned real estate empire much like Trump’s. Sales “windows” for the tower in Mumbai have been offered since 2014, yet just over half of the building’s 400 units have sold, according to the Lodha Group. That would mean roughly a quarter of the units sold belong to Shah and his fellow diamond traders. But Suparna Salaskar, a former Lodha Group employee who managed interactions with buyers until just a few months ago, said in an interview that she knew of only one unit being sold since Trump announced his candidacy in June 2015. The Lodha spokeswoman did not respond to a request to confirm Salaskar’s observation but said the most recent of three sales windows was in June 2016. The Trump Organization also did not respond to a request for comment. In addition to Trump Tower Mumbai, the company has brand-licensing deals for buildings in three other Indian cities. The Mumbai apartments are not expensive by Trump standards. Three-bedroom units start at $1.3 million. But the building is surrounded by competitors, all facing a market slump, and the president-elect’s name may not be hot enough to prevail. “The question was always: Does the market value his brand that much higher?” said Ashutosh Limaye, head of research at Jones Lang LaSalle in Mumbai. The building boom in Mumbai’s Lower Parel and Worli neighborhoods has created a glut of luxury apartments, Limaye said, although most of the towers have yet to be completed. Developers are in a race to finish their projects as prospective customers hold off buying until they can be assured of move-in dates. The Trump Tower is not ahead in this race. Nevertheless, Shah, the diamond dealer, said part of the reason that he and his colleagues bought at the Trump Tower was that they thought the Trump Organization would pressure the Lodhas to complete construction by the promised date. Their decision stemmed from particularly Indian factors, too. Shah had an apartment in a different high-rise nearby, “but the vastu in the building was totally off,” he said, referring to the age-old Hindu science of architecture, similar to feng shui. Vastu purports that a building’s layout profoundly affects its inhabitants’ harmony with their surroundings – and some business executives think bad vastu can ruin a fortune. Shah has had a priest who specializes in vastu assess his purchase. “I know that at least the part with my apartment is relatively good,” he said. He and the other diamond traders moving into the building are all members of the small but financially powerful Jain community, as are the Lodhas. The Trump Tower is going up next to an ornate Jain temple, which is a selling point. Shah explained that Jain diamond dealers had made real estate deals with the Lodhas before but had been disappointed by construction delays. Salaskar said that an average Lodha-built apartment would “come into possession two to three years late” and that buyers at the Trump Tower have been told that they could have to wait until 2019 for completion. Salaskar said she had dealt with dozens of potential buyers in Trump Tower Mumbai and that just one or two were ultimately deterred by Donald Trump’s politics. In fact, she said, most saw Trump’s brash style as an alluring part of his brand. Trump is someone who, in business and politics, gets things done “by hook or by crook,” she said. Real estate and politics are often intertwined in India, and the Lodha family is well-placed at the intersection of the two endeavors. The Lodha Group was founded by Mangal Prabhat Lodha, who is vice president of the state branch of the Bharatiya Janata Party, which is led nationally by Modi. Most wealthy Indians, including politicians, invest large sums of untaxed cash, sometimes called “black money,” in property. And with a little grease, powerful politicians often finagle special permissions or even land for developers, which can yield big financial gains. In 2011, Indian tax authorities discovered that the Lodha Group had about $30 million in unreported income, according to court documents. The company was ordered to pay $1 million in fines and settled a tax bill for an undisclosed amount.